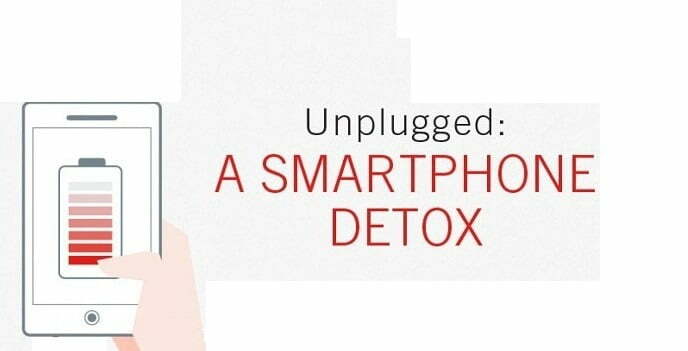 In this post, we share an interesting infographic about smartphone detoxing. Many people are addicted to their smartphones, and removing themselves from their smartphone for a period of time is highly beneficial. This infographic claims around 66% of people struggle to go without their smartphone for twenty-four hours. Smartphone addiction is often encouraged by a number of apps that involve human communication. These apps include Facebook, Instagram, Snapchat and WhatsApp. And let’s not forget that people can become addicted to checking their emails and text messages too. Let’s face it, people may contact you via 7-8 different channels via your smartphone. Your smartphone is the ultimate communication device. Staying away from your smartphone may make you feel you are missing out on important social or professional messages. Thus, smartphone addiction is arguably a form of communication addiction. Smartphone addiction could be compared to an addiction to radio communication that was popular in the twentieth century. However, unlike radio communication, smartphone communication is much more instantaneous, and perhaps it’s this ‘real time’ element that makes smartphones so addictive. One sign you may be addicted to your smartphone is that you become very anxious when you stop using your smartphone. This is because smartphone addiction is essentially a psychological addiction. This infographic terms this as no-mo-phobia, short for ‘no mobile phobia’. The infographic also discusses what happens when smartphone addicts attempt to detox from their smartphones. These people begin to suffer from a number of psychological withdrawal symptoms such as experiencing a lack of focus and disrupted attention. The infographic then catalogues the thoughts and feelings of people who underwent a smartphone detox. Many of these people said they experienced anxiety and frustration during their detox, but the experience was well worthwhile, and they now use their smartphones much less after having undergone a detox.